T20 World Cup is scheduled from 8th March and will continue till 3rd April in India. On 3rd April, grand finale will be played at Eden Gardens, Kolkata whereas first match will be played on 8th March at Nagpur. On 11th December, Friday ICC announced the complete ICC World Cup 2016 Schedule which included Women’s and Men’s Schedule. Here we will share detailed groups and schedule. 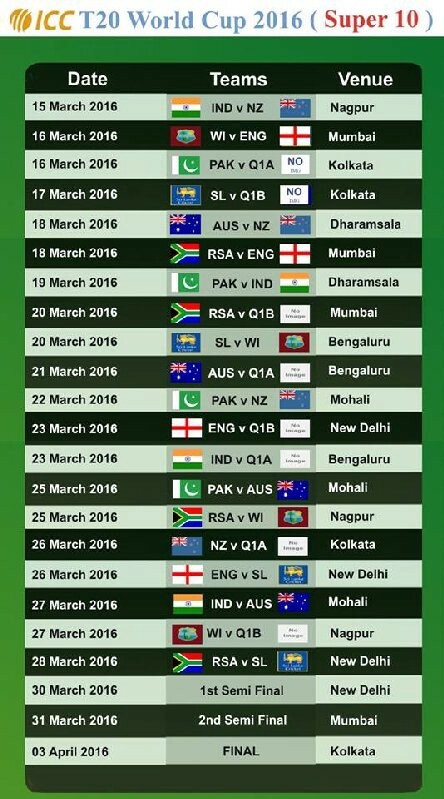 First round matches is scheduled from 8th Match to 13th March. After first round matches, on 15th March India will host New Zealand in Super 10 matches. Semi Finals are scheduled on 30 and 31st March.